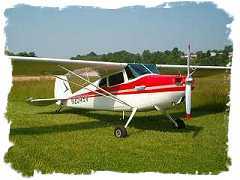 A few weeks ago, I sold the Cessna 170 that I've been advertising to a customer in Anchorage, Alaska. As part of the purchase he wanted me to have the airplane delivered to Alaska. I called an old friend, David Board, who is one of the most experienced tailwheel pilot that I know to do the trip. David's exploits would fill a very thick book and it looks like this trip will give him another chapter. I got this email from David yesterday, describing his arrival in Anchorage. Quite an adventure Steve! I am indeed in Anchorage and now safe and sound. However, after over three and a half thousand miles of trouble free flying this old bird up and quit on my on final approach to the Merrill Airport in Anchorage, which was my final destination. For a few seconds I was considering landing in the parking lot of a shopping mall that is right on final to runway 25, but I kept my head and went for broke and the runway. I dam near came up short and had to zig zag to avoid the approach lights at the runway threshold. They were sticking up like green glass stalks and I was too low to have avoided them, but I just made it onto the runway overrun and threshold and even made the first taxiway turn off. And that may have been the first time anyone has ever landed and made that turn off unless they were flying a helicopter! It was water in the fuel that overloaded the sump in the fuel system and killed the bloody engine! I don't really know how that water got there, but here is my theory. It takes a few days of high altitude and very low temp operations to get over the Rockies this time of year in an aircraft like the 170. Some of the flying is through visible moisture (rain and snow), and the gas tanks are vented so air is sucked in to replace the gas that is sucked out. The moisture in the air will generally freeze in the tanks over night so when you sump everything in the morning, there is now ice, which doesn't drain. When I came down to sea level in Anchorage for the first time since Montana, the warmer temps melted the ice and the water choked the fuel water sump. Of course when that thing fills to a certain point, nothing is allowed to pass through it so your engine dies. That way there is something of value from the salvage after the wreck I guess? It makes no sense to me, but I'm just a flight instructor. I guess I should have sumped the fuel strainer before I landed! Hah! Now that would earn me a violation for sure! Anyway, as it happened either by dent of good luck or good airmanship or possibly a bit of both, I made it on to the runway and pushed it off down a taxi way. I put 32 gals of fuel in the tanks and it holds 42 so I had a little over an hour of fuel still on board. But other than a very exciting ending to a very exciting trip, "no damage no foul" as we say here in the US. Damn it was close though! I am glad that it turned out this way because I really like Don the buyer, and I'm staying here for a week to teach him to fly a tailwheel airplane now. He loves the airplane and even more importantly so does his wife! I am going to do an oil change for him today and then I'll fly with him every day until I leave. I am also teaching his kids to play chess, so the whole family loves me. Don is very impressed with you by the way. Well, we all are Steve. I thank you for this adventure! Got anymore? They had a mid-air up here about an hour after my landing so the feds have their hands full (5 fatalities!) Anyway I have my gas receipt and a statement from the FBO stating it was a top off. If I need it that will prove that I had better than VFR reserves, so I am off the hook with the Federalies, no matter what. You know me! Yet another chapter in the life of a flying vagabond! This is a wonderful life, and live or die, I wouldn't swap my times with any man, living or dead!